Year after year I encounter powerful movie, TV and YouTube clips that provoke meaningful discussions about Easter and Christ’s sacrifice for us (we even saw one last season that we highlighted on our The Gospel According to The Walking Dead blog). One of the best representations of Christ I’ve encountered comes from the 1960 epic film Ben Hur, a movie sweeping 11 categories at the Oscars, including Best Picture. 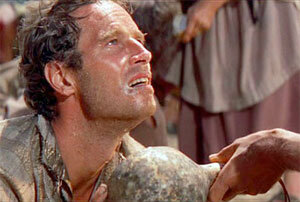 In a random scene, a slave falls to the ground and utters a prayer, “God, help me.” And then Jesus shows up. Amazing scene. We wrote up a discussion with the clip and small group questions HERE. Sometime the Gospel shows up in the most random places. Spielberg’s 1997 film Amistad is a prime example. The scene takes place on a slave ship where a slave named Yamba looks through a Bible illustrated with New Testament events. What ensues is a powerful presentation of the Gospel. We wrote up a discussion using this clip, including small group questions HERE. This YouTube clip (another great free resource from our YouTube Discussions page) uses an excerpt from a famous sermon delivered by Rev. S. M. Lockridge, an African-American preacher of great renown. The visuals are mediocre… but the words are powerful. We wrote up a discussion using this sermon and provided small group questions HERE.